No other building in the world is like the Eiffel Tower. It is made entirely of iron and steel and is an admiration for its beauty for anyone who stands before it. The enormous size and scale of this masterpiece of engineering will amaze you with the cool architecture that still carries the charm of one of the most romantic places in the world - Paris. The Eiffel Tower is the undisputed symbol of the French capital. Many believe that this structure is anything but not beautiful. At night it is illuminated by thousands of lights and then you can definetly not deny the special unique charm that the Eiffel has. In fact, the beauty and harmony of the Eiffel Tower can be felt best at night. In the 19th century it was lit with 10, 000 gas lanterns which illuminated the steel structure. They were completed with both the projector and lights of blue, white and red colors to symbolize the national flag of France. In 1900, the Eiffel Tower had been equipped with electric lamps. The current light show, which is visible today in the night from the Eiffel Tower was installed in 1985 and for the first time was switched on, on the 31st December. Today, every hour for five minutes silver lights are included in the illumination which finally completes the magic of the Eiffel Tower. The Eiffel Tower is named after the French engineer, Alexandre Gustave Eiffel, who was the creator of the project. It was created as an entrance arch for the World Expo in 1889 which was to be held at Campus Martius on the occasion of the centennial of the French Revolution. The whole project of raising the Eiffel Tower was estimated at 6.5 million francs. The story began in 1887 when the idea of erecting this steel giant was born during the year of 1884. 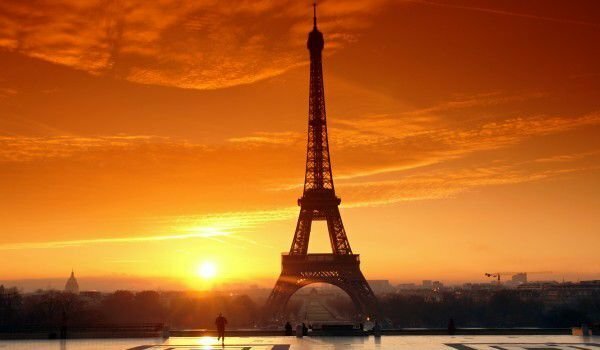 The Eiffel Tower was completed in less than two years and was lit on March 31st and opened on May 6th. 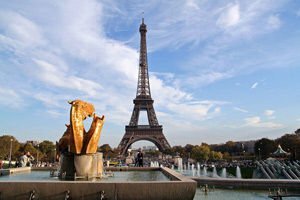 At the beginning there were preconceived ideas about the Eiffel Tower, like that it was scheduled to be demolished after 20 years. Eventually the metal structure becomes a laboratory for researce and for this Gustave Eiffel contributes generously. Several devices such as barometers to lightning arresters and other appliances were installed into the construction. Currently, the Eiffel Tower is owned by the city hall in Paris, who has entrusted the operation of the new company operating the Eiffel Tower, which is a company with mixed ownership. Due to the pressing need today, the Eiffel Tower is a lightweight with 1340 tons, accumulated over the years, a winding staircase on the third floor was replaced with that of straight line segments. The Eiffel Tower reaches an impressive height of 312 meters, and with the antenna is 324 meters high. By 1930 it was the tallest building in the world. The total weight of iron used to build the Eiffel tower is 10, 100 tons, of which 7, 300 tons is the actual weight of the steel structure. The construction of the Eiffel Tower involved 50 engineers and designers, 100 people working on the individual fragments and 132 workers who assembled them. A total of 15, 000 metal parts form the structure of the Eiffel Tower were used. About 6 million people annually visit the Eiffel Tower. 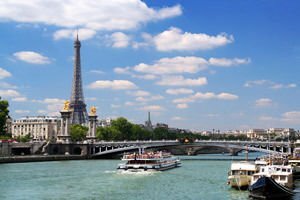 Since it was established in its metal structure it has undergone over 200 million visitors, making it one of the most popular attractions for visitors not only in Paris but also worldwide. According to some studies, the Eiffel Tower is the most famous and photographed landmark on the ground.